We must be Ruddy Mad! Based in at the former Brooklands Aero Club House & Control Tower here at Brooklands, we have a dedicated team to help you with your Ruddspeed vehicle needs, whether a simple service or a full restoration. We fabricate and wheel all our own panels, we also have Miller TIG welding facilities, weld Stainless Steel, gas weld aluminium and of course MIG. We have a Low Bake Oven system with expert colour matching for the ultimate paint finish. 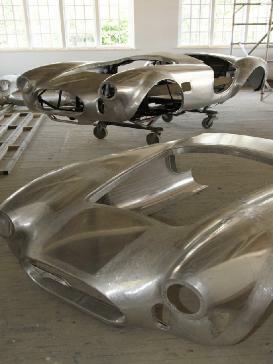 Shortly we will be creating and building new Ruddspeed cars, these aluminium hand crafted body and chassis are produced on the original Thames Ditton Factory tooling and drawing specifications. 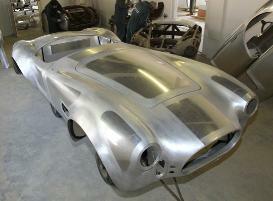 This will be a classic looking car with modern technology and reliability. We are currently putting together a 'Ruddspeed Registry' of all the known Ruddspeed cars whether they be an AC, Healey, Volvo, Alfa, Mustang or other marques. So we would love to hear from you with any information, memories, stories and photographs as it will all help preserve the Ruddspeed history. If you have any questions or enquires or wish to discuss your new build requirements please contact us for further information.